This post explains how to read and use Analytics reports to improve your win rate. The screenshots in this article are from an active house cleaner (Sample Business). 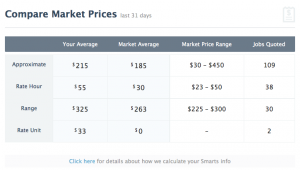 The Analytics Market Prices report shows whether you are quoting below or above the market average for each price type you use. The Sample Business uses four different price types to quote. They used the Approximate Price type most often with 109 quotes, then the Hourly Rate with 38 quotes, followed by Range with 30 quotes, and finally Rate Unit twice. Across the board, they’re more expensive than the market, and that’s okay if they provide a premium service to justify a premium price. We don’t agree that cheapest is always best, which is why we don’t rank you according to price. However, if you know how your prices compare you can position yourself as either a budget or a premium business and make sure your service quality matches your price. 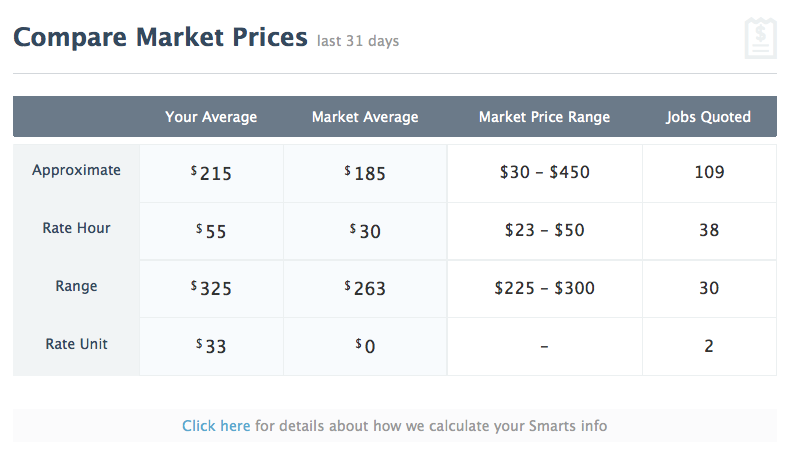 If you think you’re a premium business but are actually cheaper than the market, you may be able to raise your prices. If you think your prices are cheap, but they’re actually more expensive, you may need to do more to justify the premium price. The Analytics Quote Speed report shows whether you are faster or slower to respond to new leads compared to the market average. The quicker you quote, the more likely you are to win the contract. Understanding how you compare will give you a massive edge. The Sample Business responds to new leads quickly. They beat the market average by over 2 hours and rank amongst the top third of businesses (12 of 94). This is even more impressive considering they’re quoting a lot. Businesses who quote often will find it hard to top the rankings because we compare them to businesses who may have quoted really quickly, but just a couple of times. If you’re slower than average, try the mobile site to quote when you’re on the road. If you only get a daily leads summary, turn on instant lead emails so you get an email as each new job is listed or dedicate time regularly during the day to quote. The Analytics Proximity report shows whether you are closer to or further away from new leads compared to the market average. The closer you are to a customer, the greater chance they’ll hire you. The further away you are, the lower the chances you’ll win their business. The Sample Business is much closer than average to the jobs they quote on. They are 15.8km away from each lead which is almost 7km closer than the market average. Once again, they are in the top third of their market (19 of 94) which we reckon is pretty good. You have less influence on Proximity to customers than Price or Quote Speed, but knowing how you compare can help you position yourself better. If you’re very close to new leads, position yourself as a local expert. If you’ve done work for a prominent local business, or have worked recently in a suburb, mention that in your quote messages. If you are generally far away from customers, you may need to offer some concessions to win their business. The Analytics Reviews & Ratings reports show whether you have more or less Reviews, or a higher or lower Feedback Rating perentage compared to the market average. Customers read your Reviews and consider your Feedback Rating when comparing you to other businesses. You can get more Feedback and improve your score by reminding past customers to leave you a rating. 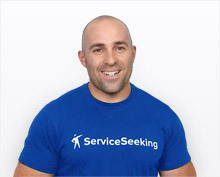 This is not limited to ServiceSeeking.com.au clients – you can also ask customers from outside ServiceSeeking.com.au to leave a positive review. The Sample Business has 14 more feedback reviews than local competitors and a market leading Rating percentage. You’re doing fine if you’re ranked in the top third of your local market for Quote Speed, Proximity, or Reviews & Rating. Customers will pay a premium price if you’re quick to respond, are local, can do a site inspection quickly, and have lots of Positive Reviews. However, if your quotes are more expensive, and you are slow to follow up leads, too far away from clients, don’t have any Reviews or a poor Rating percentage, you’ll struggle to compete and may have to change your strategy. Overall the sample business is doing well. They are responding to leads quickly, are priced slightly above the market, are closer than average to potential clients, and have a lot more feedback reviews and a market leading Rating. They can justify a premium price with a premium rating and service.